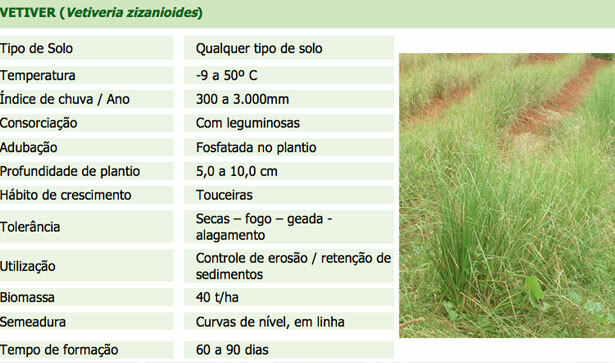 Vetiver is a perennial grass present in various climates, especially in tropical and subtropical ones. It is Medium sized and reach up to 1.50 m high, resistant to pests, diseases, water deficit, frost and fire. It is an erect growing plant which form clumps, and reproduced by seedlings only. It has a dense and high strength root system reaching up to 3 m deep. The roots have an aggregate root, forming a natural stabilizing stapling on slopes and embankments. It adapts to any type of soil and climate, and it is tolerant to rainfall indices between 300 to 3,000 mm a year and periods of extreme water deficit of five months. Tolerant to extreme temperatures between – 9 to 50°C. 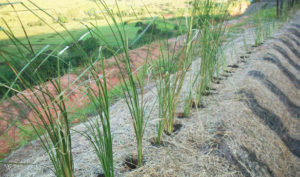 Unlike most clumps of grass, plants which grow on vetiver grass go towards each other (positive biotactism), forming a living plant barrier. It is tolerant to extreme pH values, salinity, toxicity, and low levels of nutrients in the soil, it is also resistant to fire, flooding and grazing. The planting can be accomplished throughout the year, but preferably in the rainy season. Reproduction is exclusively by seedings, because seeds it produces are sterile. It is much used for string planting, transversally to the slope steepness for retaining sediments. It is intercropped with legumes. 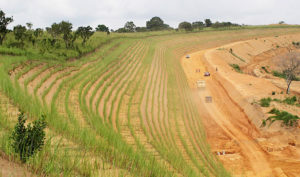 Used as barriers to contain sediments and stabilize landfills and eroded areas. 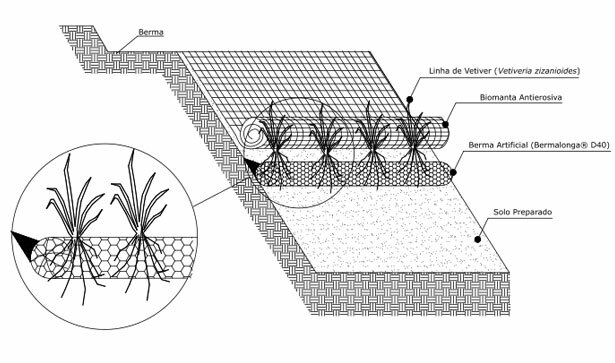 The vetiver barriers allows for retaining sediments carried by water. 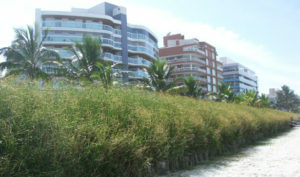 With the succession of these events, a natural terrace will be formed behind the grass curtains to avoid soil degradation. Apart from that, it breaks the downward flow intensity of the rainwater, thus contributing to the surface drainage system, enabling a more economic estimation (lower run-off in the contribution area) and no annual maintenance costs. 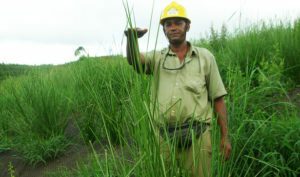 Vetiver is not a host plant or a mediator of pests and diseases. It also has great carbon sequestration capacity – about 5 kg/plant/year incorporated into the soil.